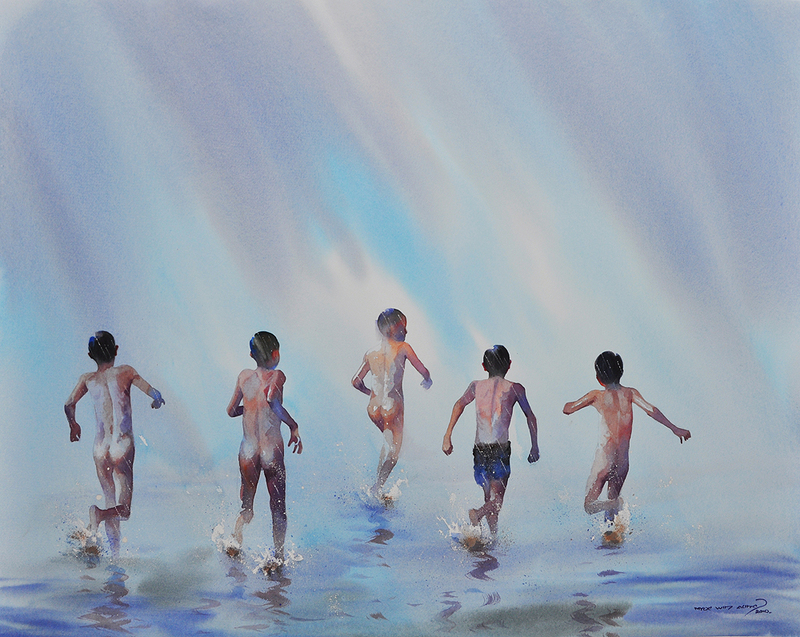 This large, beautiful watercolour shows five boys splashing and running from the viewer amid a monsoonal downpour. It is deeply evocative of Burma and its seasonal rains and showcases Myoe Win Aung’s compositional and technical excellence. Myoe Win Aung was born in Rangoon (Yangon) in 1972. He graduated from the State School of Fine Arts, Yangon (Rangoon) majoring in painting. A protege of the artists U Lun Gywe, U Kyaw Lay, U Mya Aye and U Thit Lwin Soe, he is known for his composition and most particularly for his watercolours that frequently depict figures in Burma’s monsoonal rain. Religious life and Buddhism also are important sources of inspiration. His works are illustrated in Myanmar Painting: From Worship to Self-Imaging(2006) and Burmese Painting: A Linear and Lateral History (2009). Page 318 of the latter includes a half page painting by Myoe Win Aung that is in the same series as the example here. Ranard, A., Burmese Painting: A Linear and Lateral History , Silkworm Books, 2009.